Two Macklin Motors Hyundai dealerships in Edinburgh have undergone a major renovation as part of a £600,000 investment. The interior and exterior alterations are part of a continued investment by Macklin Motors in its dealerships and reflects the rolling out of a new corporate identity by Hyundai. The dealerships, in the East and West of the city respectively, have undergone extensive work including interior remodelling to create a more natural flow with a modern look. The interior layout now includes a customer waiting area with a coffee lounge and a specific handover lounge, complete with an unveiling plinth. The exterior of the dealerships has also benefitted from a full refurbishment to bring both in line with Hyundai's new corporate identity guidelines. These include updating all signage from the previous blue to bronze and the installation of a large bronze arch over the entrance to the showrooms. Macklin Motors Hyundai West has newly built state-of-the-art valeting and MOT facilities, meaning that for the first time the dealership is able to offer a full and extensive Aftersales service for customers. On the other side of the city at Macklin Motors Hyundai East, significant renovations include a contemporary showroom with a new floating ceiling, heating and modern energy efficient lighting installed. John Gavin oversees both Macklin Motors Hyundai sites in Edinburgh. He said: "Everyone at the dealerships are thrilled with the results of the renovation. It's a great working environment for our colleagues and the new branding from Hyundai looks very sleek and modern. The new showroom layout and upper-floor office space means that we can further enhance the excellent service we offer to our customers. We've already received lots of compliments from returning customers. "The new service and MOT areas have been fitted with the best equipment money can buy, meaning that for the first time we will be able to provide our customers in Edinburgh with a full service from purchase, through MOT and any repairs or maintenance their vehicle may require further down the line." 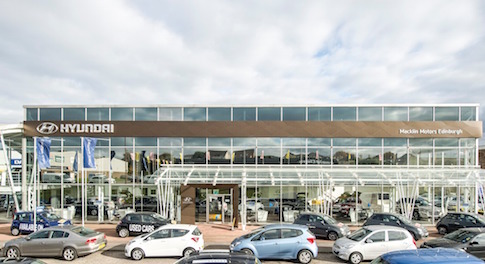 Simon Balback, Vertu Motors Divisional Director responsible for the Hyundai Dealerships, said: "We are delighted with the refurbishments at our Edinburgh Hyundai sites. We believe this will improve the customer buying experience and help us to continue to provide the highest level customer service possible and keep pace with the growth in the motor industry. "The business continues to go from strength to strength and this investment demonstrates Vertu Motors' continued commitment to investing and developing its dealerships in Scotland."